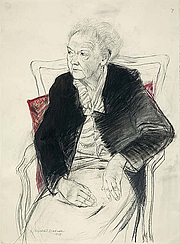 Margaret H. Swain (1909-2002) In 2001, a pencil drawing of her by Elizabeth Blackadder was accepted by the Scottish National Portrait Gallery, donated by her children in honour of their mother’s 90th birthday. Textile historian Margaret Swain was the first person to realise that Scotland was unusual in the number of private houses which still contained historic textiles. Swain documented these textiles from old family papers and bills, and brought them to scholarly attention. She made an important contribution to the study of the fine series of tapestries at the Palace of Holyrood and has published on the needlework of Mary, Queen of Scots. Margaret H. Swain is currently considered a "single author." If one or more works are by a distinct, homonymous authors, go ahead and split the author. Margaret H. Swain is composed of 4 names. You can examine and separate out names.